In the middle of each Legislative Session, there is a frenetic time period called “crossover week”. It is characterized by a flurry of debates and votes in a compressed timeframe. 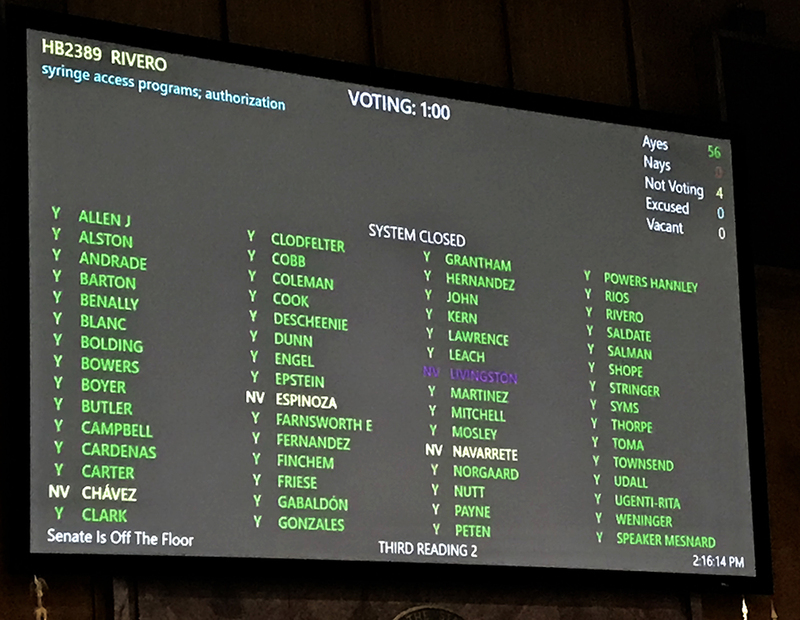 The purpose is to pass on as many wacky bills as possible in each chamber of the Legislature before successful bills are passed to the other chamber. (Hence, the name “crossover week”). 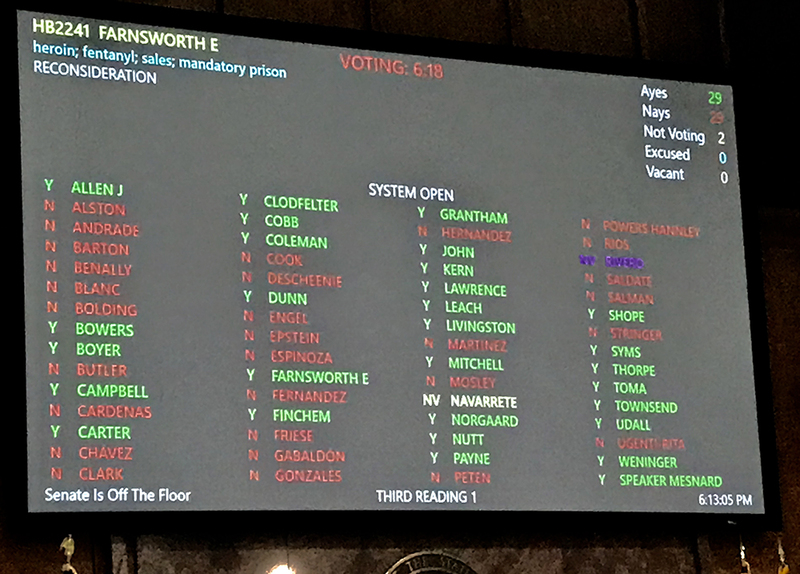 Rep. Randy Friese (my seat mate in LD9) resurrected the ninja parliamentary move last week to force a vote on his bill to ban bump stocks (the accessory that allowed the Las Vegas shooter to convert his guns to assault weapons. The Republicans did the same thing they did in 2017 when we used this parliamentary move to force a vote on the Equal Rights Amendment; they did a substitute motion. 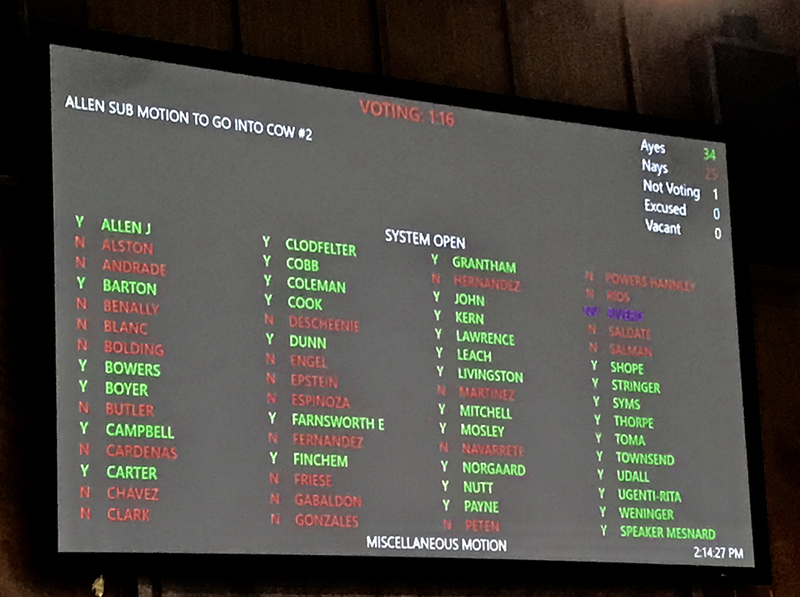 A “yes” vote above is a vote to shut down debate and not vote on banning bump stocks. 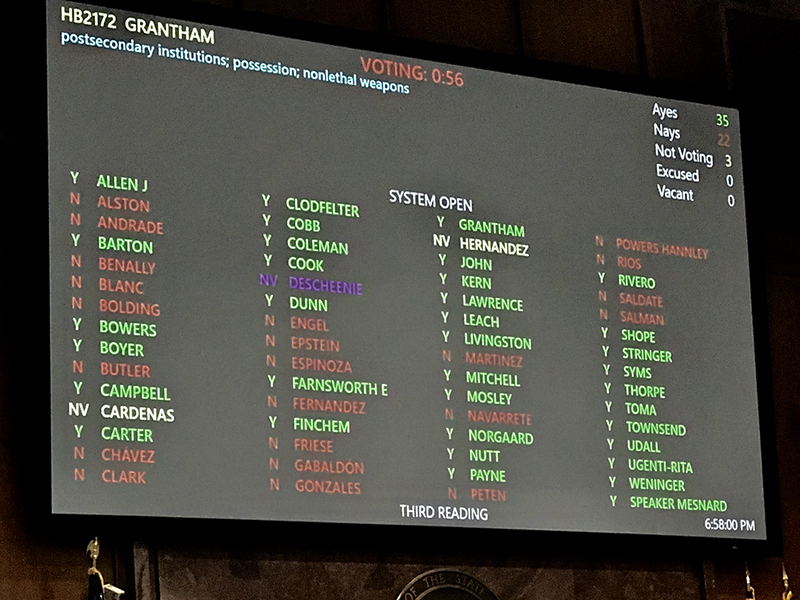 HB2172 would allow people to carry “nonlethal weapons” on college campuses. Tasers and flash bombs — what could go wrong? We also voted on what happens to your guns if you go bankrupt. HB2211 would allow people who go into bankruptcy to keep up to $5000 worth of their weapons. 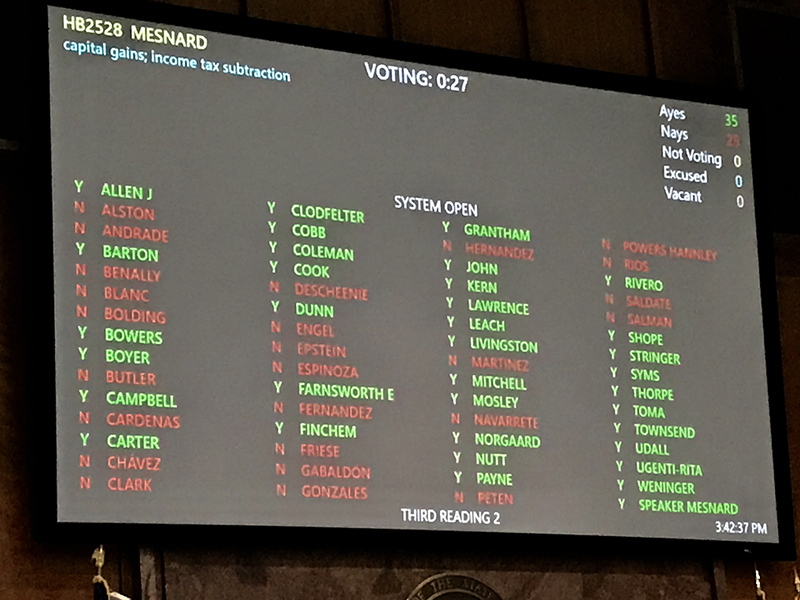 HB2528 gives a capital gains tax cut to the richest Arizonans. There is a great debate on the Capitol TV between Speaker J.D. Mesnard and Rep. Mitzi Epstein in COW on Feb. 21, 2018. 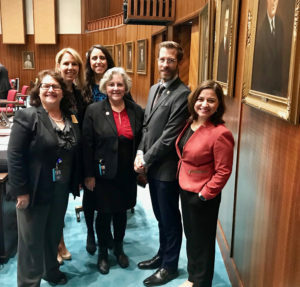 HB2389 legalized needle exchange programs. This does not create a needle exchange program. It just gives legal cover to organizations that do needle exchanges. This passed with almost no comment. Will the Governor sign this? The Democrats wanted to include needle exchange in the big opioid bill, but it was a no-go in the Executive Tower. HB2241 creates mandatory sentencing for fentanyl and heroin. It makes the sentence equal to second degree murder. 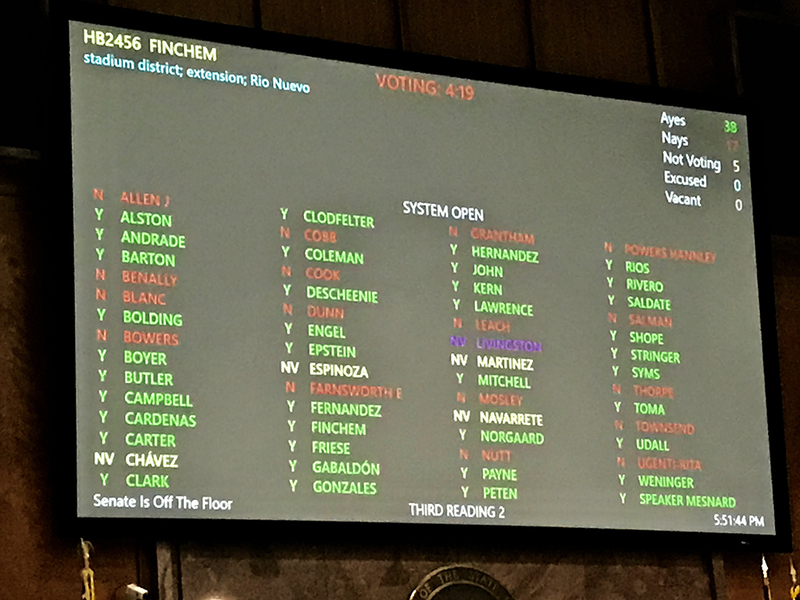 HB2241 failed (27-32) on Feb. 14, but Rep. Vince Leach brought it back for reconsideration on Feb. 20, 2018 and passed. Speaker J.D. Mesnard left the board open for 20 minutes or more in order to give party hard-liners enough time to twist arms. The new guys– Reps. Dunn and Toma– were two of the flip-floppers on mandatory sentencing. The final vote was 32-27. 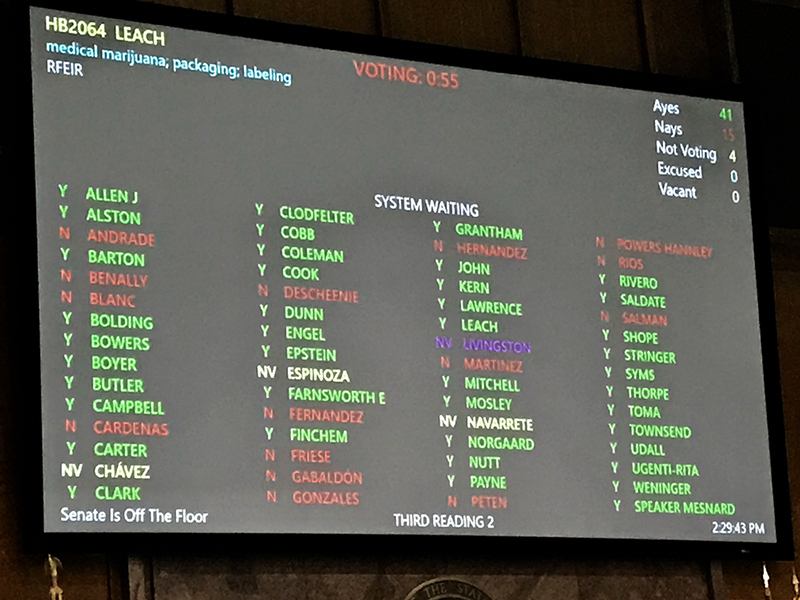 Rep. Vince Leach had several anti-medical marijuana bills in 2018. HB2064 originally targeted small business owners who make THC edibles. It would have required they to change their packaging so it wouldn’t “target children.” The language was way to vague, and it would have put unnecessary regulation on these small buisnesses. There was an attempt to make this less bad by adding a six-month delay to any packaging changes. 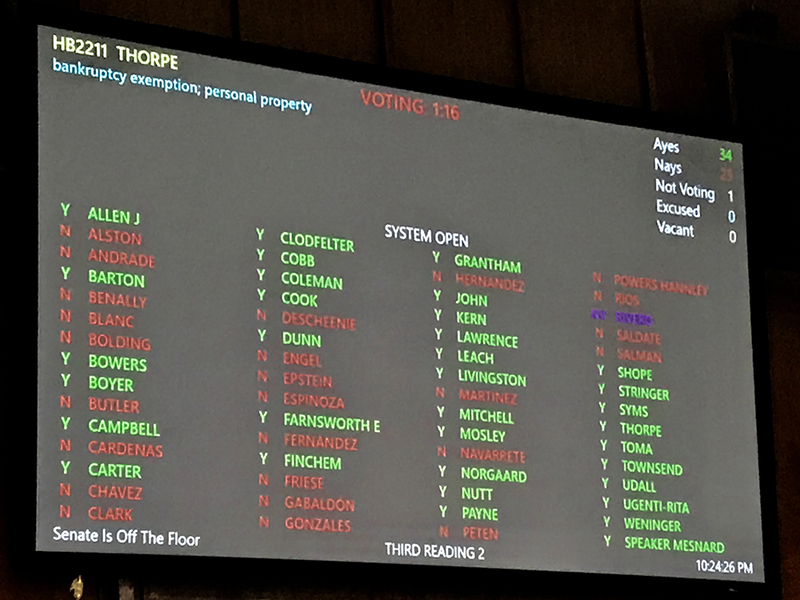 This bill died because it needed a 3/4 vote– since it attempted to change the medical marijuana law, which was created by Citizens Initiative. Leach’s HB2066 and HB2068 also failed. HB2066 would have used $38 million from the medical marijuana card fund to teach people about the “dangers of medical marijuana.” When I asked Leach what the dangers of medical marijuana are. He said there are “pages and pages”, “lots of numbers” on the Internet. For fun, watch that debate here. HB2563 puts restrictions on freedom of speech on university campuses. It says that schools should come up with a “freedom of speech policy.” I thought the First Amendment was our country’s “freedom of speech policy.” Republicans fight to protect the Second Amendment. The First Amendment– not so much! 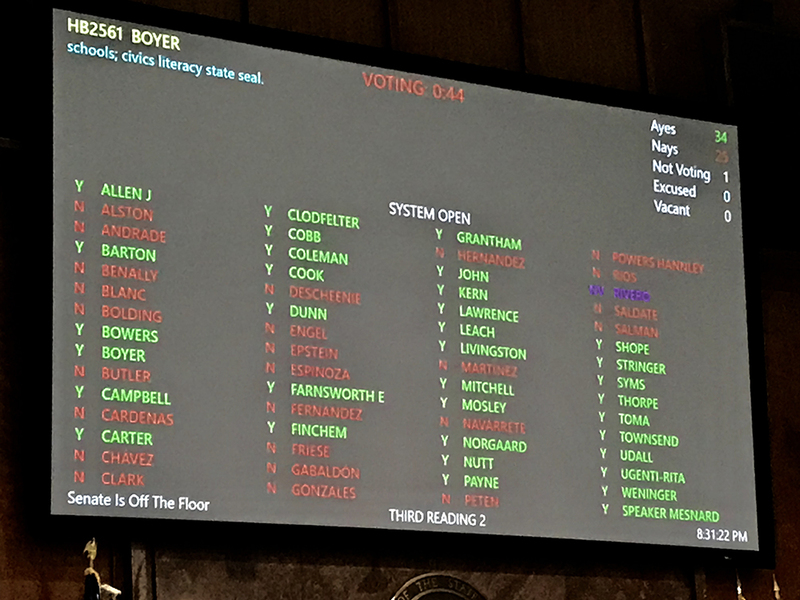 HB2561 creates a state-sanctioned “civics literacy” endorsement for high school graduates. Freedom School faculty would create the curricula from historic “source documents like the Federalist Papers, Thomas Pain and de Tocqueville,” according to the sponsor Rep. Paul Boyer. And Ayn Rand? 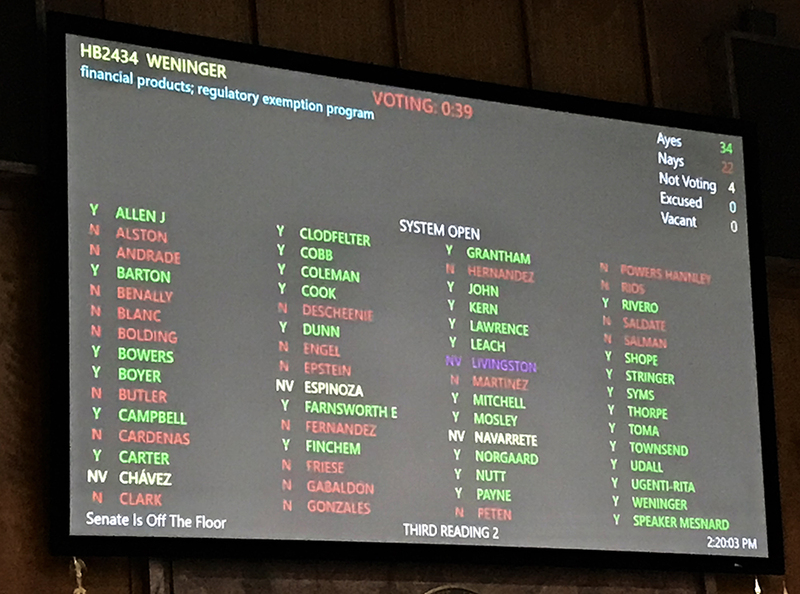 HB2434 creates a “regulatory sandbox” with unlicensed businesses can “test innovative financial products” on Arizona consumers. Again– what could go wrong? After all, payday loans and interest-only mortgage loans worked out so well for us. The Democrats really hammered home that lack of consumer protections in this bill. Reps. Jeff Weninger and Maria Syms said “not to worry about fraud” because the Attorney General will be watching the sandbox. The Democrats were concerned about consumers losing their cars or their homes in legal, unregulated deals. Watch the debate on Capitol TV, COW 3 on Feb. 22, 2018. 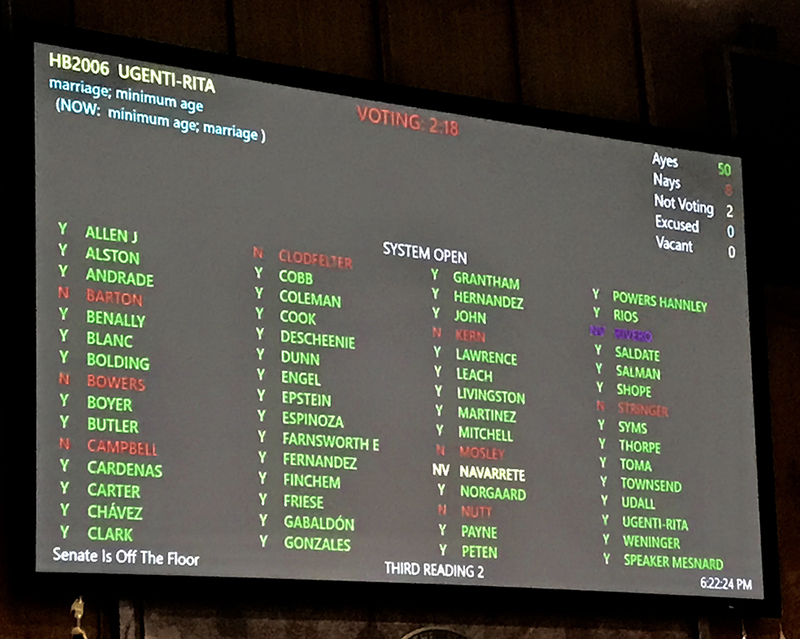 HB2006 was a attempt to make 18 the official marriage age in Arizona. Rep. Eddie Farnsworth, chair of the Judiciary Committee, watered this down and lowered it to 16 to get it out of committee. 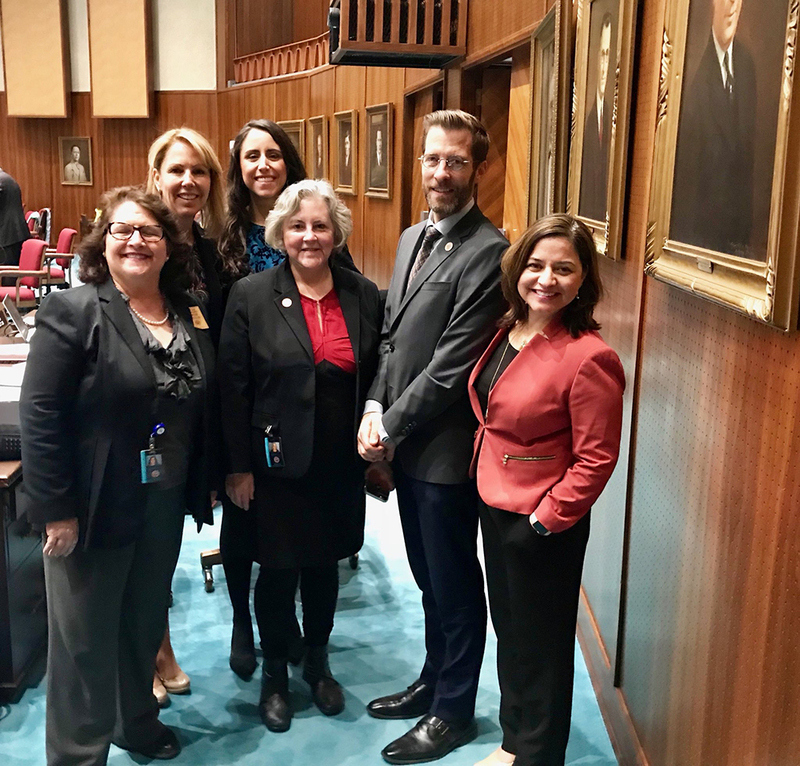 I applaud Rep. Michelle Ugenti-Rita for proposing this bill. To hear how the “no” votes explained themselves, check out the COW on Feb. 20, 2018 on Capitol TV. 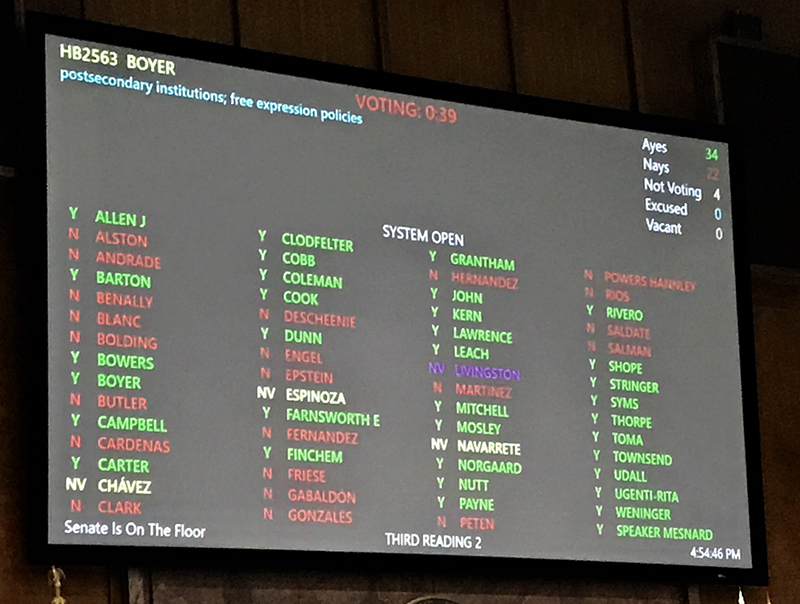 To watch any of the archived videos from the Arizona Legislature, go to the Capitol TV link here. You can also watch live here.